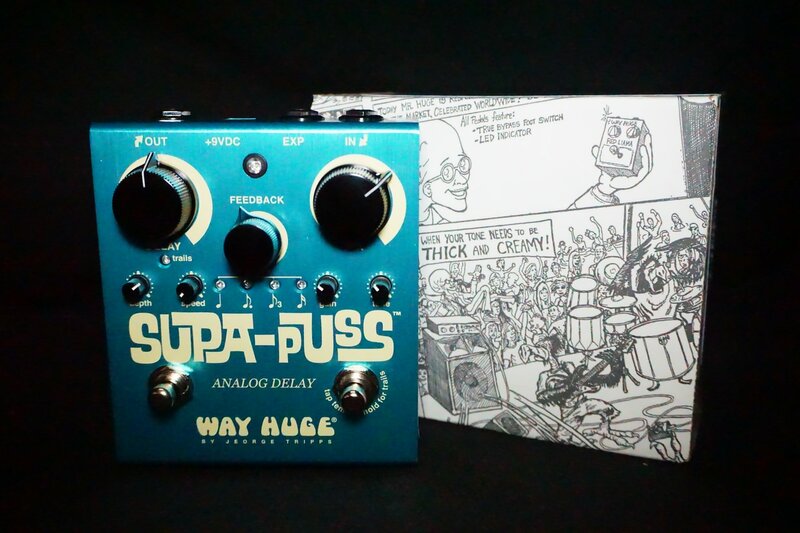 The Way Huge Supa-Puss Analog Delay was designed by delay master Jeorge Tripps for exploring the farthest reaches of true analog delay potential, featuring an eternity of delay time and fine control over numerous parameters of your delay signal. Tripps equipped this pedal with a total of six bucket-brigade chips, delivering up to 900 milliseconds of delay time. With the Tap Tempo switch, you can program in real time up to three full seconds of delay time for ethereal ambience. The Subdivision control allows you to set how your repeats are subdivided, and by switching to the unique Chase mode, you can set your repeats to cycle through each of the Subdivision values in different ways for maximum freak-out effects. In addition to standard Delay and Feedback controls, Tripps included several controls for fine-tuning the sound of your repeats: Tone for shaping color, Gain for adding grit, and Speed and Depth controls for adding shimmering, liquid textures with the Supa-Puss Analog Delay's LFO modulation circuit. For even further tweakability, Tripps added a true Mix control so you can set your desired blend of wet and dry signals. Finally, the Supa-Puss Analog Delay has an expression pedal jack so you hook up an expression pedal for continuous, real-time control over the Supa-Puss' delay time.